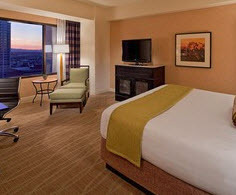 Come on out to Tahoe and enjoy a one-of-a-kind experience at the Hyatt Regency Lake Tahoe! It's TOO easy with these great incentives. Our friend Susan at the Hyatt has made it well worth your while to set up "base camp" for your Tahoe visit at her awesome property! Discover an alpine paradise at Hyatt Regency Lake Tahoe Resort, Spa and Casino. Nestled within the Sierra Mountain Range, the stunning locale of this Four-Diamond hotel is the ideal setting for year-round pampering. Enjoy the only upscale resort in the area featuring a private beach and access to all ski mountains. Take a cruise on our private boats. Tempt Lady Luck in the casino. Or ease tired muscles with a deep-tissue massage in our world-class spa. From delicious cuisine to amazing amenities, you'll experience an incomparable mountain escape. All of these benefits are yours when you book and deposit your visit by September 30th, 2016. Only blackout dates are Dec. 23 - Jan 1.